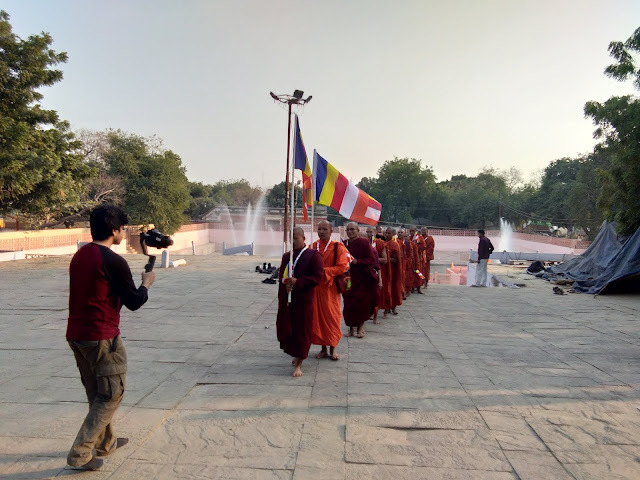 Nava Nalanda Mahavihara (Deemed University), Nalanda in Collaboration with the Light of the Buddha Dhamma Foundation International (LBDFI) organized 5th Dhamma Walk from Jeṭhian to Rājgir on 13th December, 2018. 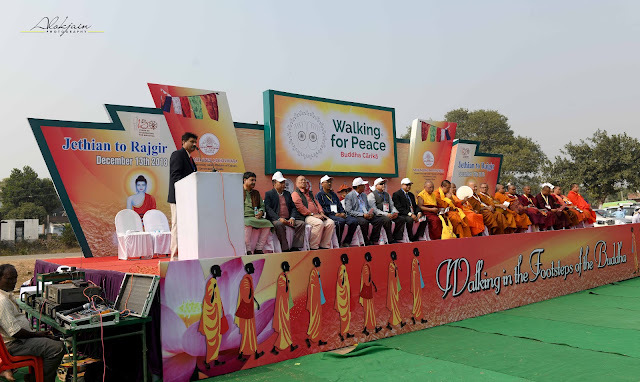 Objective of the Dhamma Walk was to facilitate awareness generation towards the 15km Jeṭhian - Rājgir Buddha trail. More than 2000 Venerable monks, nuns and laity from 15 countries participated in the Dhamma Walk.The 15km walk along the footsteps of the Buddha concluded at Veḷuvana, Rajgir. Community of Jethian offered Saṅghadāna (food-offering to ven. 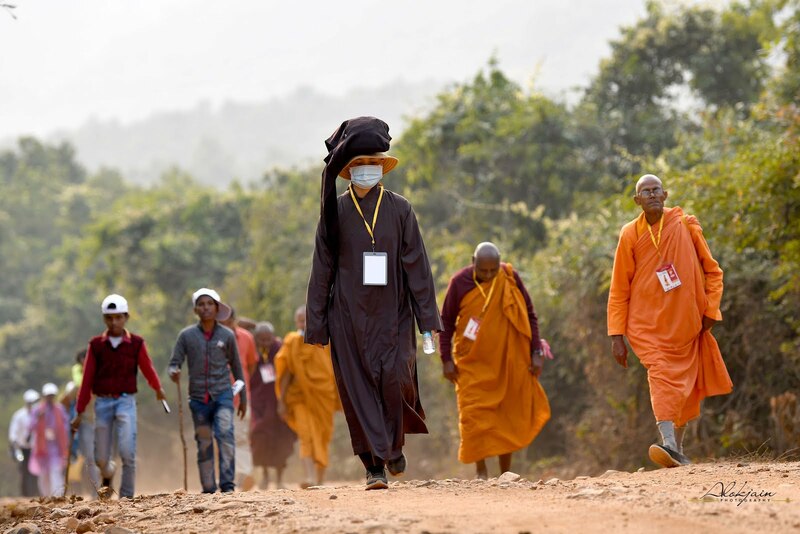 monks and nuns) to the participating monks, nun and laity. 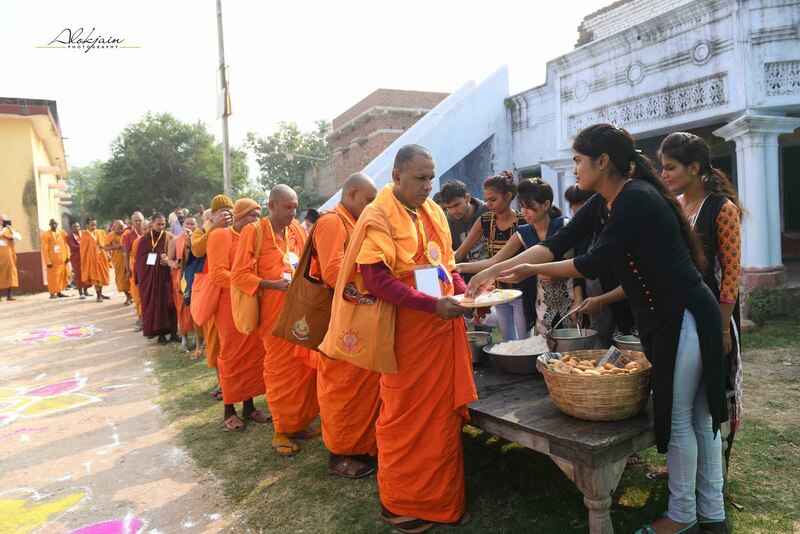 This was 4th Saṅghadāna offered by the community. 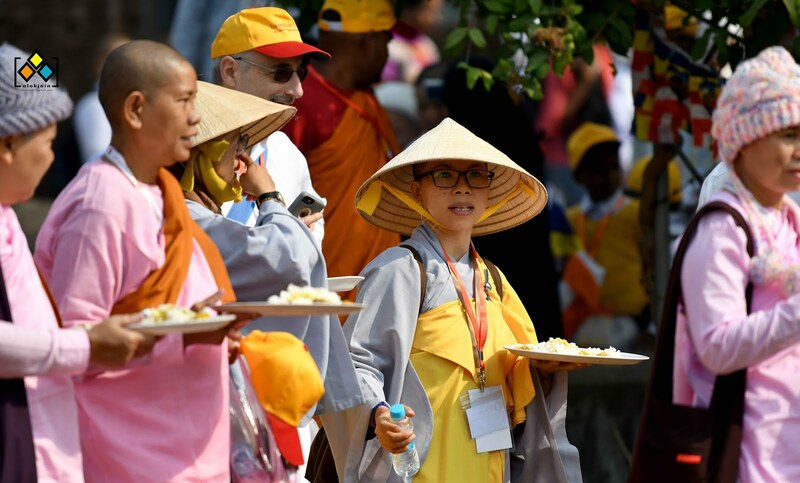 More than 600 Venerable monks and nuns from India, Thailand, Srilanka, Vietnam, Cambodia, Myanmar, Laos, Nepal, Indonesia, Malaysia, Japan and Taiwan with their alms bowl in their hands walked in the streets of the Jeṭhian village and collected food. 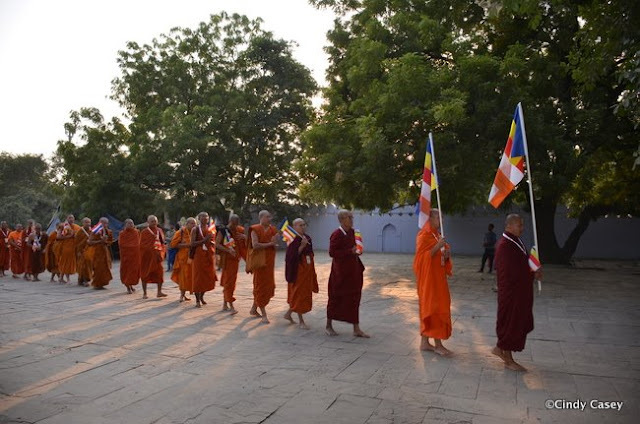 After the Saṅghadāna, the monks and nuns gathered for the inaugural session of the Dhamma Walk. 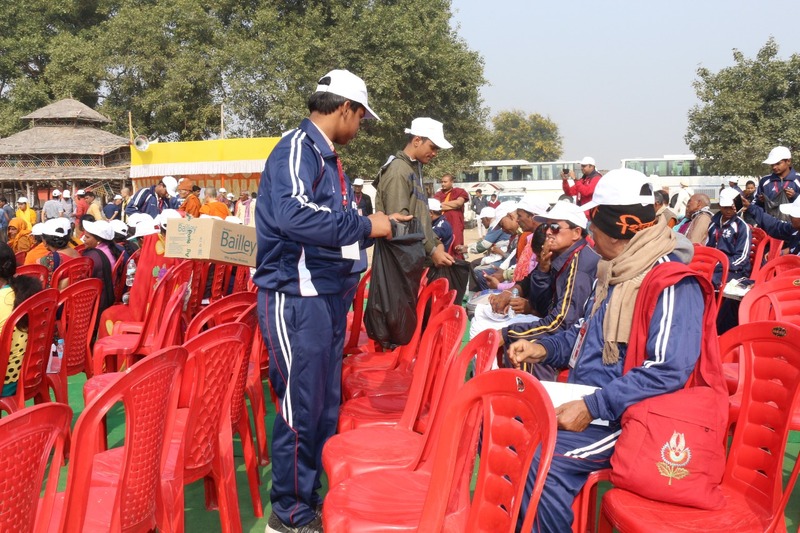 As in previous years, this consisted of addresses from the various organizers and important dignitaries. 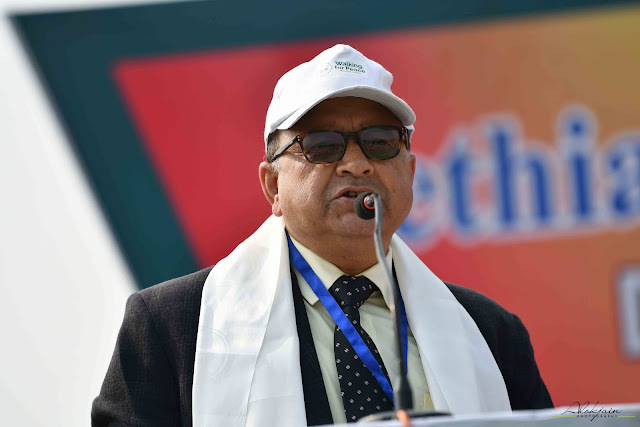 Inaugural address was given by Prof. Baidyanath Labh, VC, Nava Nalanda Mahavihara). Ven. 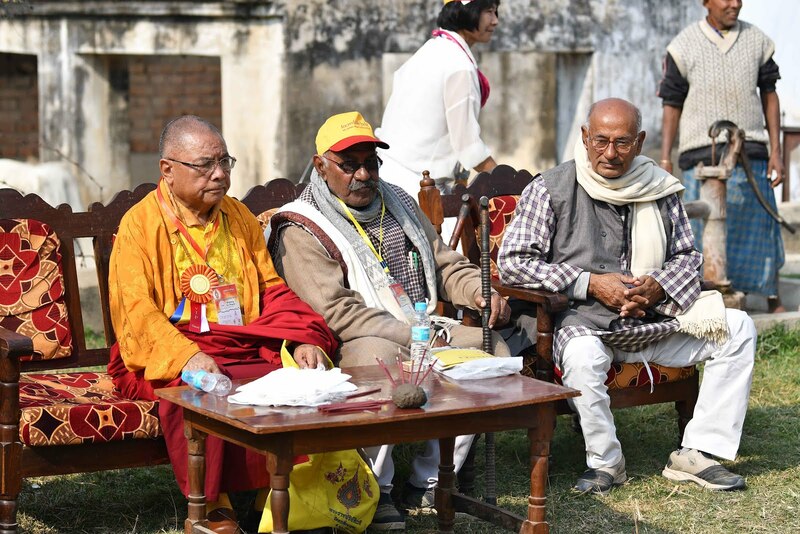 Lama Lobzang (President, IBC), and Dr. Ravindra Panth, former director, NNM also shared their views on the occasion. Ms. Wangmo Dixey (Executive Secretary, LBDFI) gave the thanking note. More than 100 members of Angel Yoga Group, Nalanda under leadership of Shri Jai Singh participated in the Walk. The members of the Yoga group cleaned up litter off the Buddha Path trail. Wife of Mukhiya Ji, Shri Sadhu Sharan ji expired on the same morning (13th December). 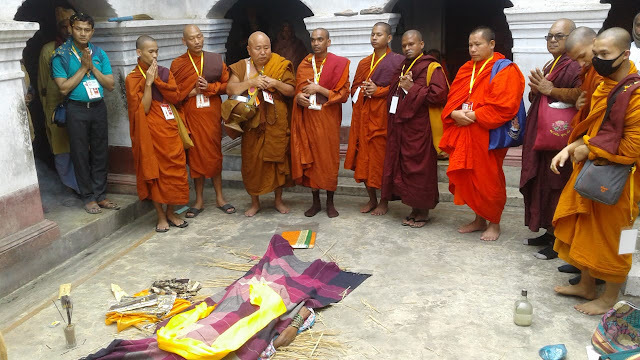 Venerable Sangha offering prayers for the departed soul. I had privilege to be a part of the third annual Dhammayātrā of the International Saṅgha of the LBDFI (Light of the Buddha Dhamma Foundation International). As all of us know, Buddhism was lost from the Indian subcontinent in the beginning of 1st millennia. 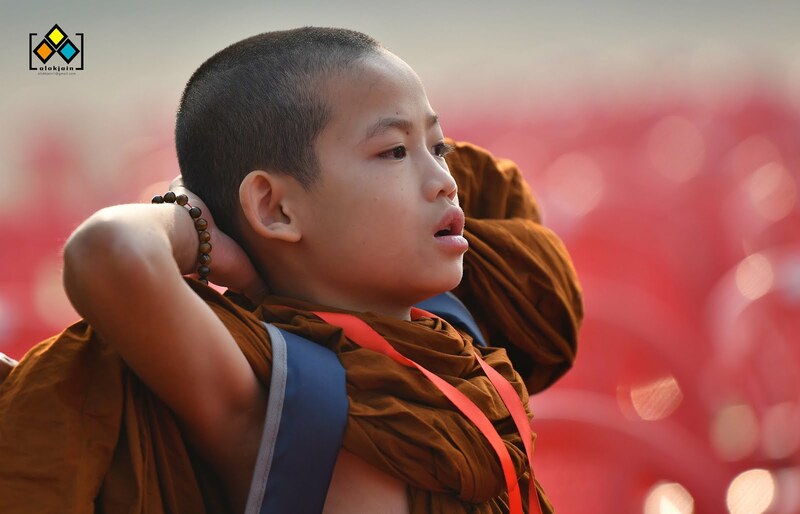 Translation of ancient Buddhist texts - kept in monasteries of Myanmar, Sri Lanka, Nepal and China- from their native languages into English and French led to the discovery of the Indian origin of Buddhism. 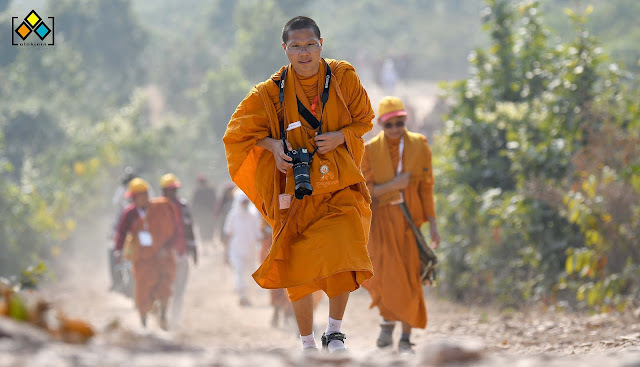 Further studies of Buddhist texts, especially travel accounts of Chinese monks Faxian and Xuanzang, led to the discovery of the sacred places related to the footsteps of the Buddha. Most of the sacred sites associated with the wandering of the Buddha like Śrāvasti, Saṅkāsya (also Sankissa, Sankassa), Kuśhinagara, Vaishālī etc. as they are seen today are but the skeletal remains of their glorious past. But, these sacred places were once living heritage sites. In ancient times, these sites saw a constant footfall of devouts from different countries who visited these sacred places, relived the legends and stories, performed merit-making rituals and recited sutras delivered by the Buddha. 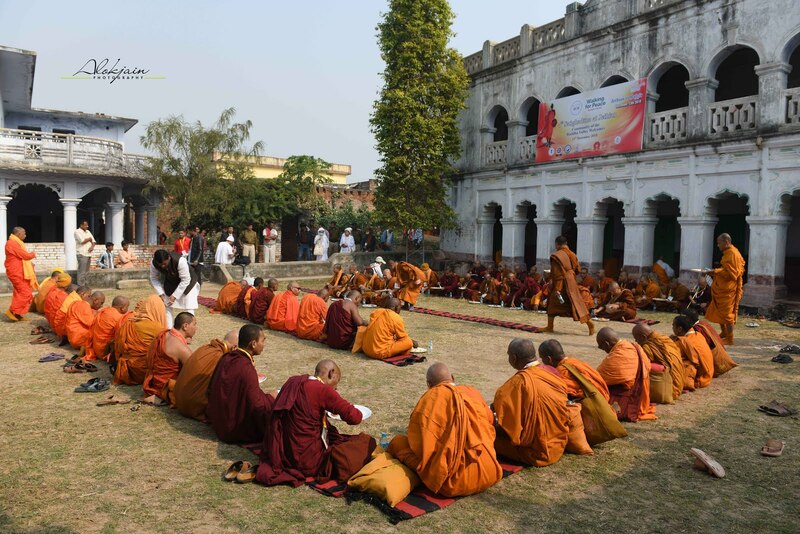 Dhammayātrā by the International Saṅgha under the banner of LBDFI is an effort to revive this very same ancient tradition of Dhammayātrā as mentioned in ancient texts; and hence facilitate development of these sacred sites as living heritage sites. Earlier this year, International Saṅgha of LBDFI consisting of 34 Theravada monks belonging to India, Maynamar, Thailand, Cambodia and Laos made this sacred pilgrimage. 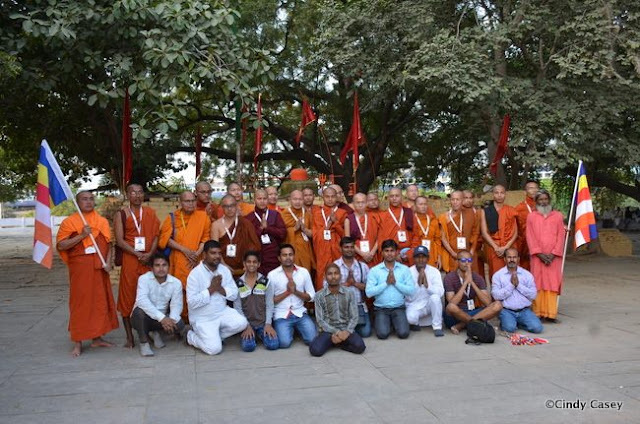 The Dhammayātrā started from Bodhgaya on 27thOctober, 2018 - touched Sarnatha, New Delhi, Sankassa, Lucknow, Kuśhinagara, Lumbīnī- and finally ended at Vaishālī on 21st November. Venerable monks of the International Saṅgha of LBDFI offered prayers and recited suttas delivered by the Buddha at these sites. Respected monks and nuns places belonging to other Buddhist countries, and from local Buddhist monasteries at Sārnātha, Kuśhinagara, Lumbīnī and Vaishālī also joined in for the chanting. 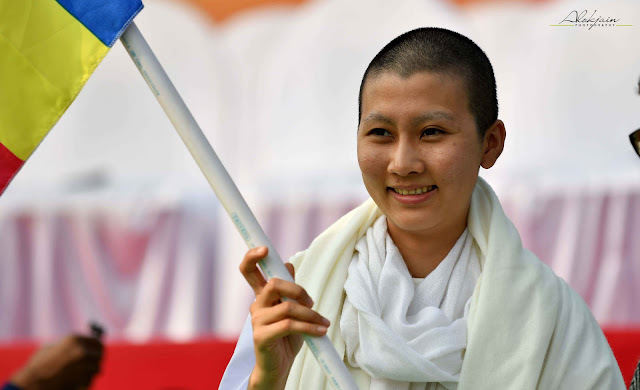 I would like to share with you two highlights of this year’s Dhammayātrā. First, Venerable International Saṅgha of LBDFI offered prayers and recited sutta at Lāt Bhairava. Lāt Bhairava is situated on the west banks of River Varṇā on the way from Vārānasī to the Deer Park (Sārnātha). Presently, Lāt Bhairava is a contested site between Hindus and Muslims, but in ancient times it was a Buddhist site. Chinese monk scholar Xuanzang mentions the presence of an Aśokan stūpa and pillar on the west side of River Barnā (now Varṇā) on the way from Vārānasī to the Deer Park (Sārnātha). Vincent Smith (1848-1920) has identified Lāt Saraiyā on the west banks of River Varṇā as the place mentioned by Xuanzang. According to Smith, the mosque at Lāt Saraiyā is built over the remains of the Aśokan stūpa while the Aśokan pillar mentioned by Xuanzang is being worshiped as Lāt Bhairav (Staff of Lord Shiva). 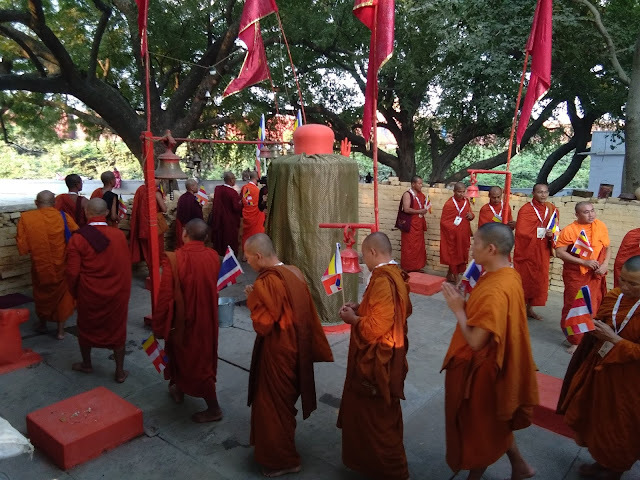 Xuanzang does not talk about the significance of the place but only tells that the stūpa and pillar erected by Aśoka lie on the traditional route connecting Vārānasī and Deer Park. Two months after his enlightenment on the full-moon day of āsālha (June-July), the Buddha preached the Dharmacakraparvartana Sūtra (the First Turning of the Wheel) to his five former companions, setting in motion the ‘Wheel of Dharma.’ The Buddha on his way to Deer Park may have walked this traditional track. 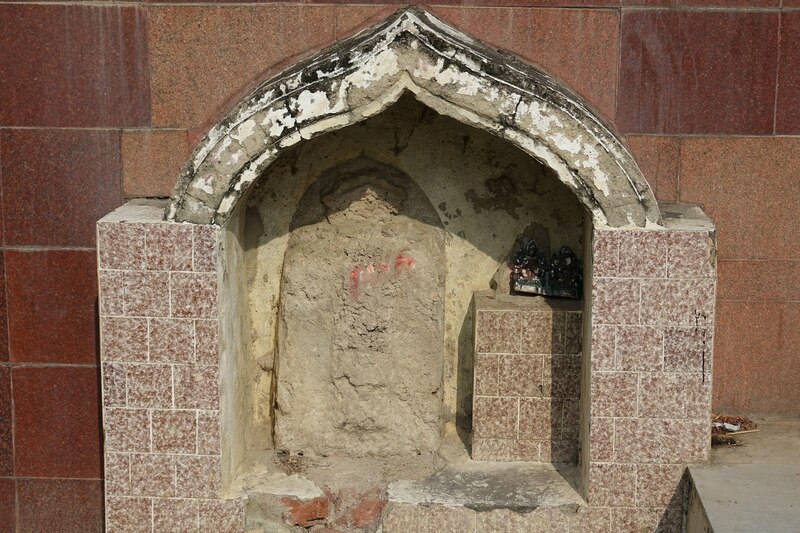 Also, recent studies suggest that this could be the place where the Buddha received Yasa, the son of a rich merchant from Vārānasī who wished to join the Saṅgha and practice the Dharma closely with the Buddha. 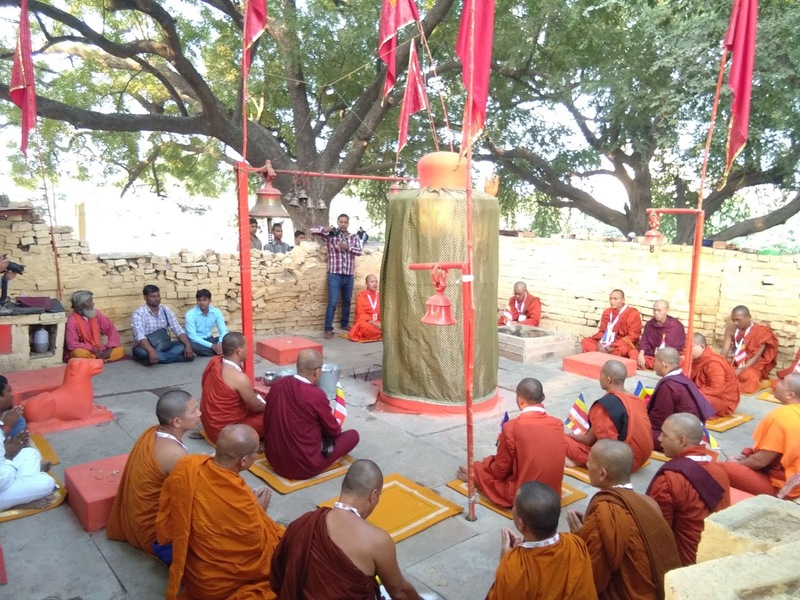 Prayers offered by the International Saṅgha at Lat Bhairava is first step towards reclaiming this ancient Buddhist sites. 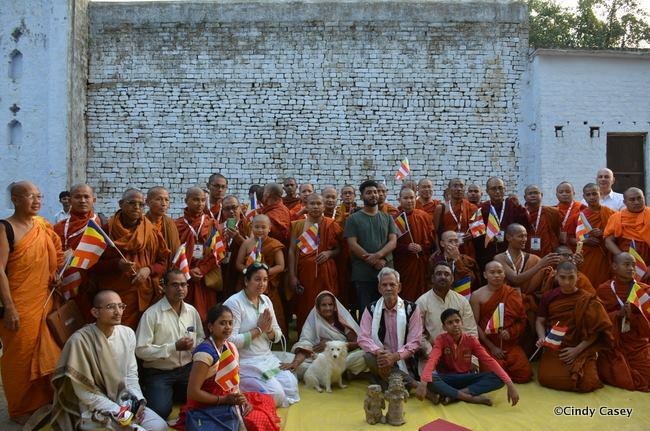 We hope this will help us facilitating revival of pilgrimage to this Buddhist site. 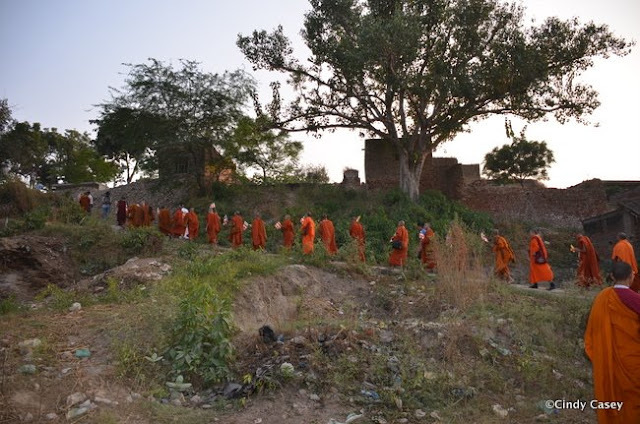 Second, the International Saṅgha circumambulated the Saṅkāsya (Sankissa) village mound. This is significant because at Saṅkāsya the Buddha performed the miracle of the ‘Descent from the heavens, accompanied by Indra and Brahma’. According to Chinese monks and scholars Faxian and Xuanzang, shrines were built at the place where the Buddha descended from the heaven. Corroborating the accounts of Faxian and Xuanzang with the ancient remains in the village Saṅkāsya, we may say that the Saṅkāsya village is sitting exactly on the top of the enclosed complex that had monastery, stairs temple and numerous stūpas. Circumference of this high mound pregnant with the ancient shrines is around 1.25kms. Saṅkāsya is the only one of the Eight Great Places of pilgrimage where the main ancient shrine is still buried and unexcavated. 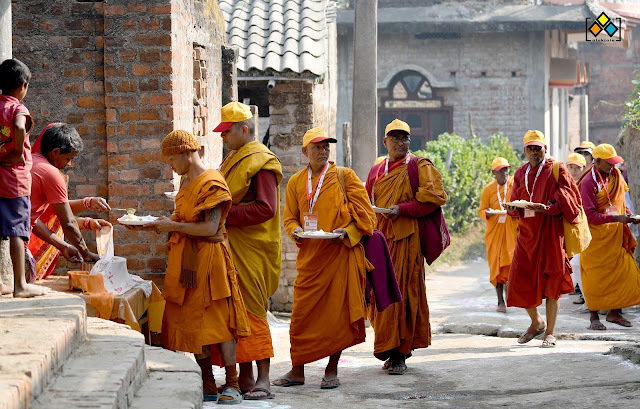 The International Saṅgha walked in the streets of the village and chanted Buddhist sutras. We also got an opportunity to interact with the Dixit family. Dixit family has done a lot towards preservation of the ancient site of Saṅkāsya. Shri Raghav Dixit and his brother showed us lost antiquities that they discovered in the village. 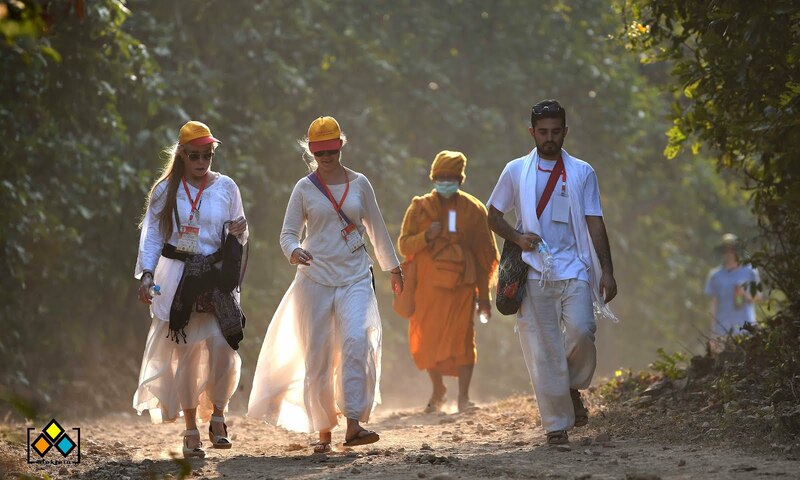 We hope the Dhammayātrā will help us facilitate the generation of awareness internationally and also among the villagers who are living over the buried remains of the very sacred temple of the ‘Descent of the Buddha’. 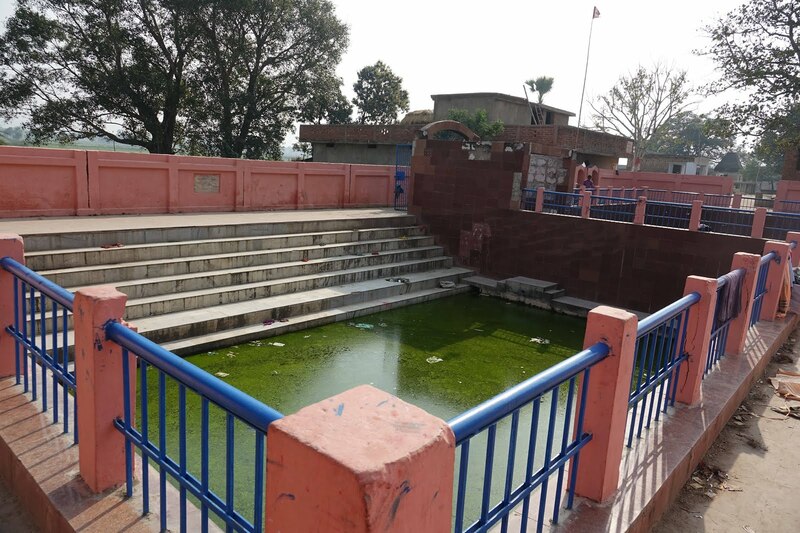 Dr Arun Kumar, Assistant Professor at Nava Nalanda Mahavihara, Nalanda on his visit to Tapovana in February, 2018 noticed a vandalised shelf inside Tapovan Temple complex which had housed ancient sculptures. According to the priest of the temple, an ancient image of Surya (Sun God) was plastered into the shelf, which has got stolen in the last few years. The priest reports that many ancient sculptures have been stolen from the Tapovan Temple complex in recent years. Dr Arun informed me about the theft of the Tapovan sculpture. Tapovana has two natural hot water springs. In 2007, during our visit to Tapovana, our team had noticed many sculptures of Hindu and Buddhist deities from medieval period kept on the shelves in the hot water spring enclosure. The hot water spring campus was renovated in 2010 and the sculptures were plastered into the shelves. Fortunately, in 2007, we had documented the approximately 2.5 ft image of Surya which has gone missing now. 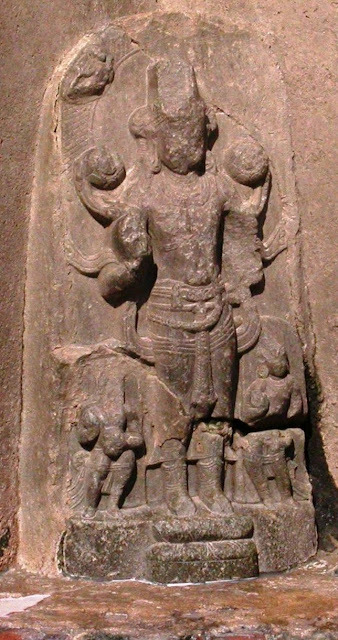 To facilitate the identification and recovery of the lost sculpture from Tapovana, I provided the images of sculptures of Tapovana to Dr. Arun. Dr. Arun revisited Tapovana on 26th April, 2018, and showed the images of the sculptures to the priest and other local people. The priest confirmed that the Surya image in our database was the one that was stolen from the Tapovan Temple complex. According to the priest, the sculpture was stolen around 5 years ago. Video clip of the priest explaining the theft of the Surya sculpture to Dr Arun. 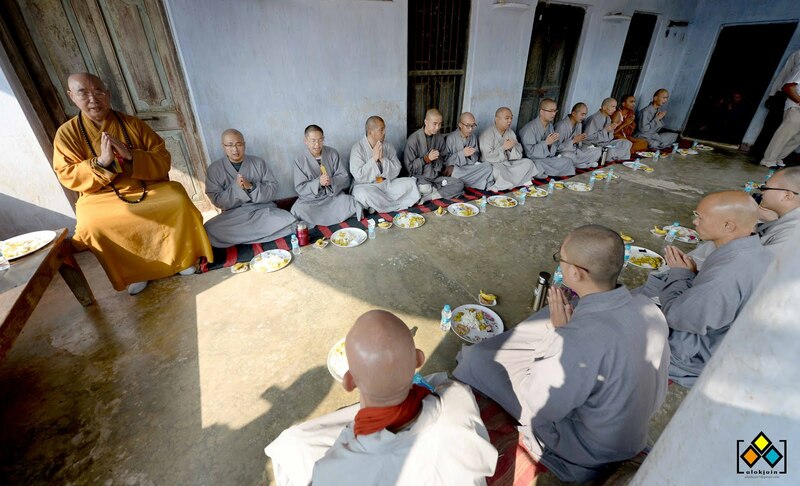 Xuanzang (Hsüan-tsang) in 7th CE on his pilgrimage to sacred Buddhist places took a sacred journey to the two hot water streams of Tapovana that were formed and blessed by the Buddha. The Buddha, according to Xuanzang, bathed here and thereafter people from all around came here to bathe and be relieved of chronic disease. Even now, one can see people from far off places gather here to take a dip in these sacred springs. The Tapovana sculpture was stolen approximately 5 years ago. Stolen sculptures exchange many hands and go through auction houses like Sotheby’s, Bonhams, Christie’s etc. before reaching their final destination - usually museums. 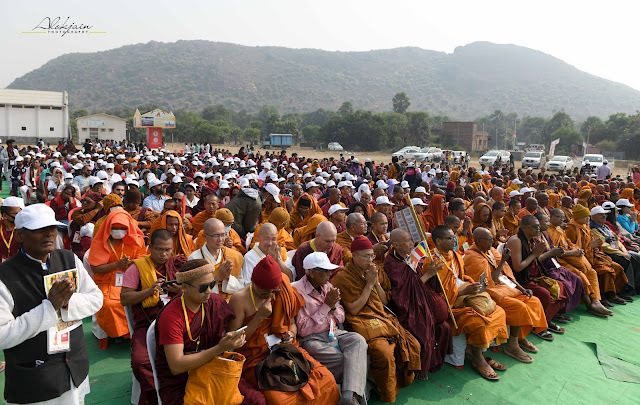 Tapovana is located 50 kms east of Mahabodhi Temple Bodhgaya and 30 kms West Rajgir. We urge like-minded people and institutions to help us find and restore this statue to its find-spot, which is Tapovana. There is some good news from village Beswak in Nalanda district. With the efforts of Shri Dinanand Pandey, an ancient mound in Beswak has now been protected by constructing a boundary wall around the mound. In the Magadha region of Bihar, there are hundreds of villages that are settled over ancient remains. Beswak is one such village. 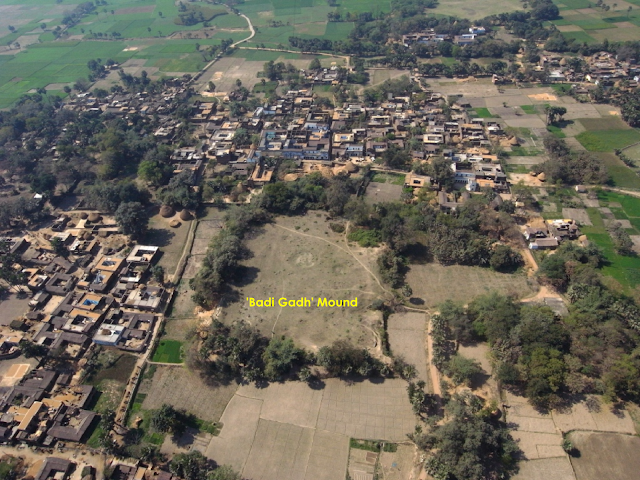 Antiquities are spread throughout this village suggesting that it was an important Buddhist centre in the past. There are many ancient sculptures of Buddha and Hindu deities scattered all around. There are many prominent mounds with the biggest one at the centre of the village spreading more than 2.5 acres and averaging 15 ft in height. In recent years this mound has been a target of land grabbers. Shri Dinanath Pandey understands the need to protect the mound, and is therefore generating awareness among fellow villagers. He has taken the matter also to the government officials concerned. Shri Pandey’s efforts paid off finally when he got to meet the officials of the Archaeological Directorate, Department of Art, Culture and Youth (DACY), and officials in the District administration. In 2015, DACY allocated 54 lacs INR for making a boundary wall around the mound. 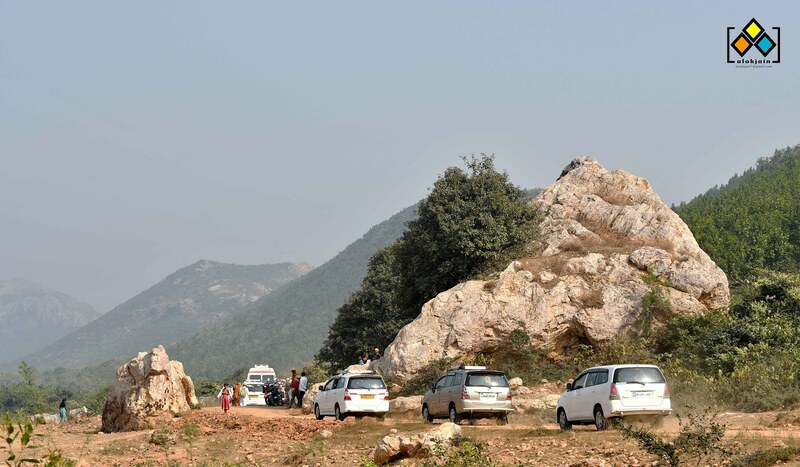 Harsh Ranjan Kumar, a Senior Technical Assistant in DACY, played a very important role in convincing the department officials of the need to safeguard this prominent mound. Beswak is situated 50 kms south of Patna, the capital of Bihar, and 35 kms south-west of Bihar Sharif, headquarters of Nalanda District. Beswak has many ancient sculptures lying unprotected under the open sky. According to Pandey ji and other villagers, the village collective of ancient sculptures that had numerous sculptures until a few years ago has now only few broken fragments. Pandey ji is aware of the importance of getting these remaining sculptures secured. 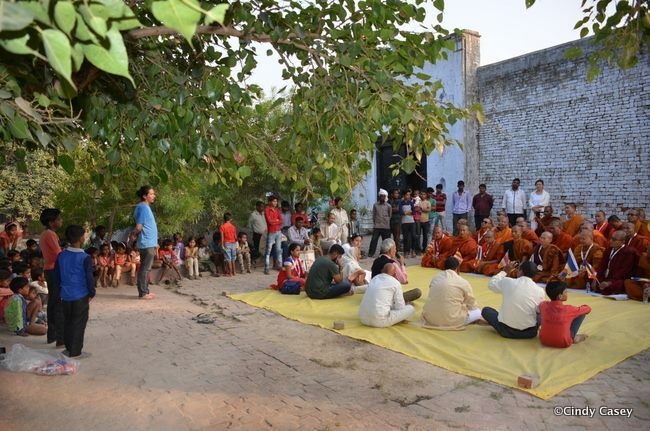 He is trying to persuade fellow villagers to create a small museum with the help of contributions from villagers. There are more than 500 villages in Magadha that has ancient remains in the form of mounds and sculptures. 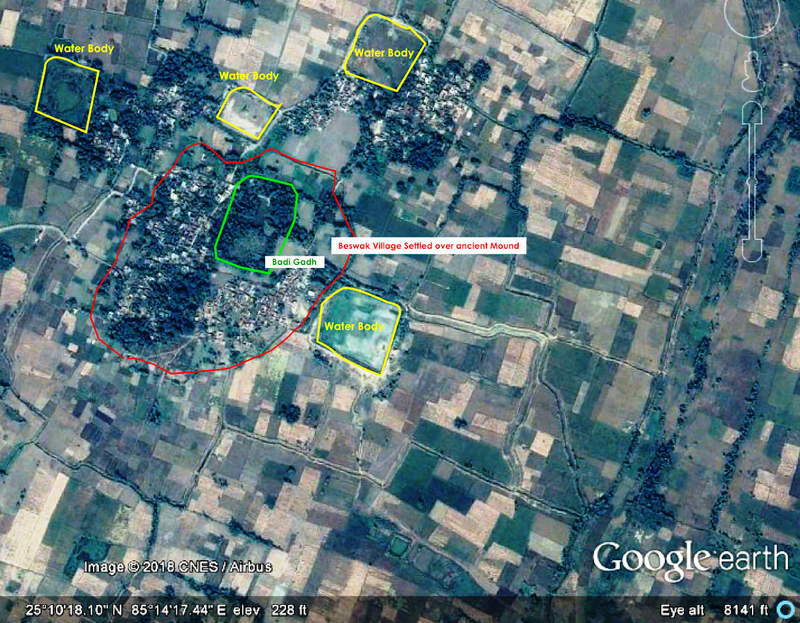 It is practically impossible for the government to protect the mounds in all the villages. 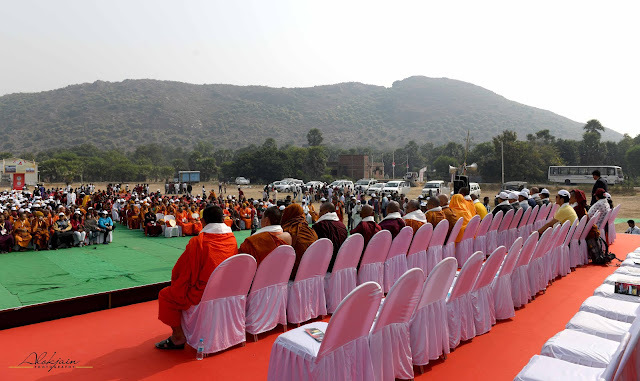 There is an urgent need to create awareness among villagers about the significance of these mounds and the necessity to protect them. Google map depicting village Beswak settled over the ancient monastic remains. Buddhist literatures indicate that in ancient times, the sites associated with the life of Buddha were linked through well developed routes which were used by devotees to reach these sacred sites and offer prayers, perform specific rituals and recite sūtras. In other words, devotees undertook pilgrimages to sacred sites to walk in the footsteps of the Buddha and have a spiritual experience. 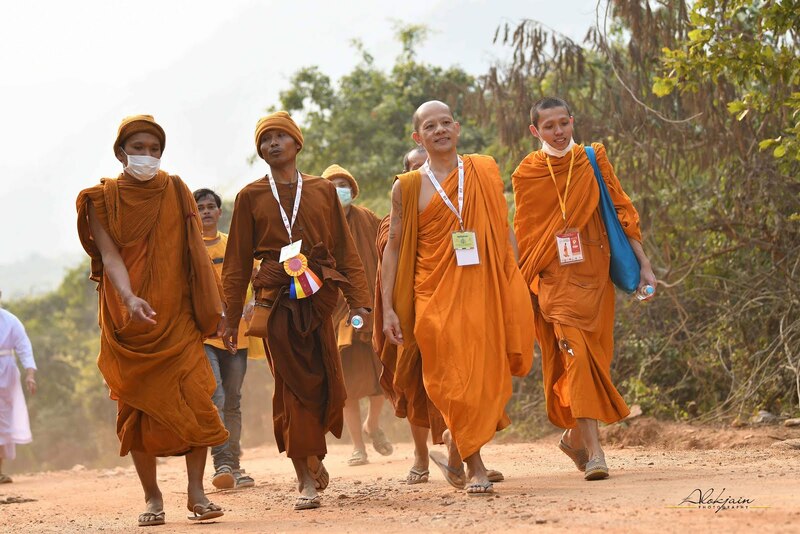 IBC is working to revive the tradition of pilgrimage (Cetiya Cārikā) by organising Dhamma walks and chantings at these sacred sites. 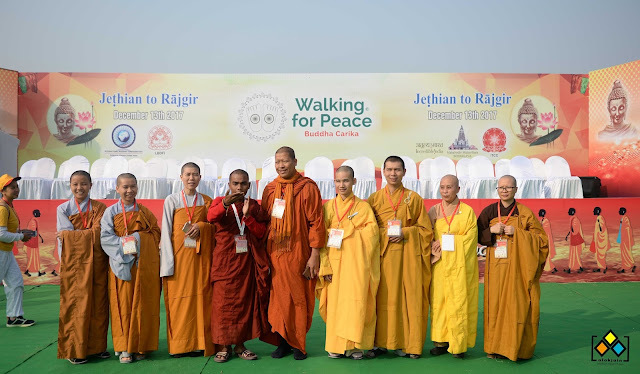 In this regard, in partnership with the Light of Buddha Dhamma Foundation International (LBDFI), International Buddhist Confederation (IBC) organised the 4th Dhamma Walk on 13th December, 2017 from Jeṭhian to Rājgir. 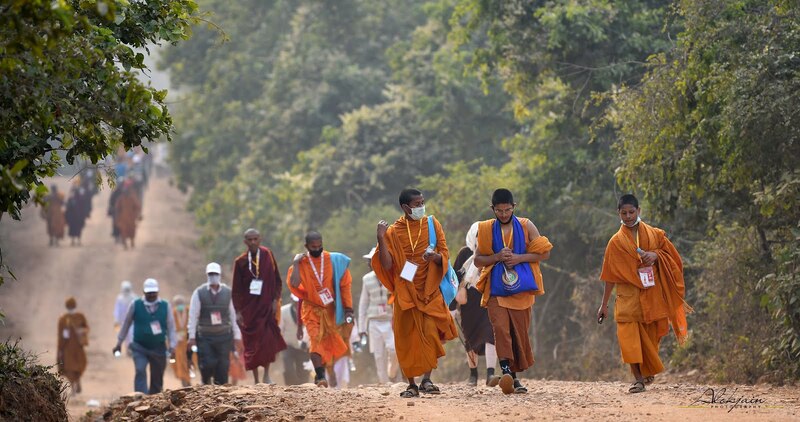 The path from Jeṭhian to Rājgir described for the annual Dhamma Walk was the same route taken by the Buddha on his first visit to Rājgir following his enlightenment. 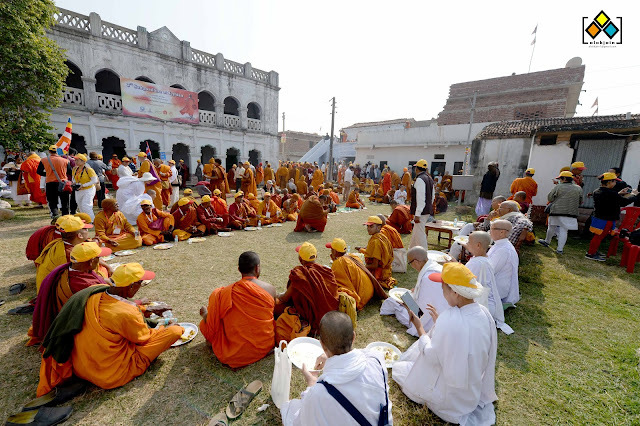 Participants gathering for the 4th Dhamma Walk and 3rd Saṅghadāna at Jeṭhian. Participants seated for the Inaugural Session. The Jeṭhian to Rājgir Dhamma Walk was held for the first time in December 2013. The walk drew widespread participation and appreciation of monks and local villagers which motivated the organisers to facilitate the walk every year thereafter. 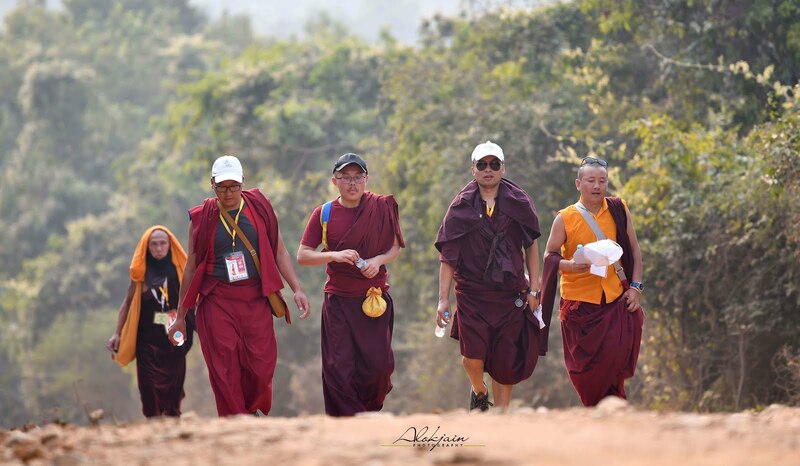 In the second year of the walk, the ancient tradition of Saṅghadāna was observed. 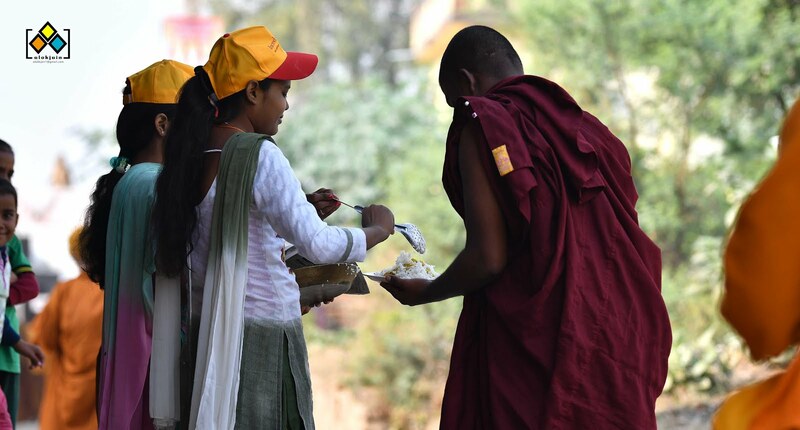 According to Buddhist literature, when the Buddha and the Saṅgha stayed in the Jeṭhian valley, they used to go out every morning to the neighbouring villages with their alms bowl to collect their food for the day. 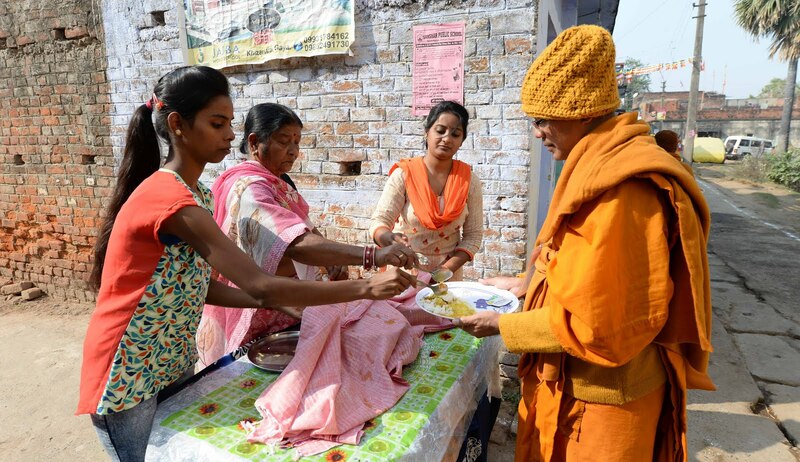 By offering food to the Saṅgha , the villagers gained merits and the blessings of the Saṅgha . For the 2nd Dhamma Walk which was held in 2015, the villagers of Jeṭhian decided to revive this ancient tradition of Saṅghadāna. In the first Saṅghadāna, about 100 monks and nuns from different countries and Buddhist traditions went to the homes of villagers in Jeṭhian to accept food. The monks and nuns appreciated highly the kindness of the villagers while the villagers felt privileged to able to make offerings to the devotees and thereby earn merits. 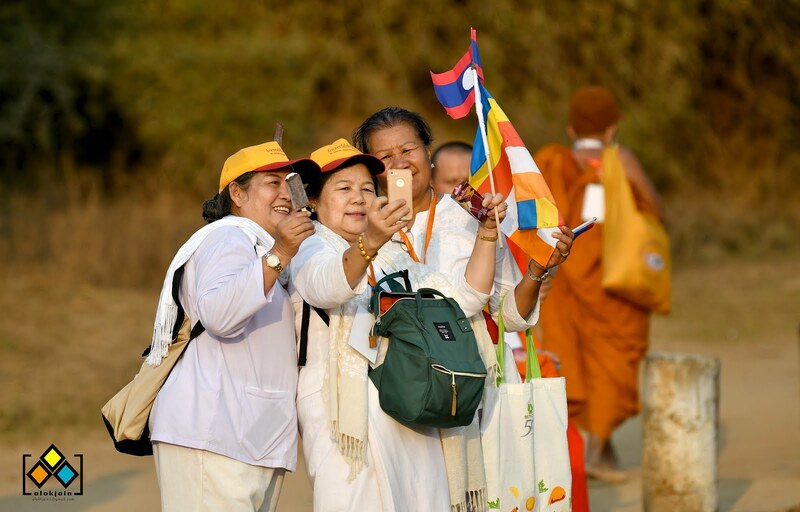 The success of the first Saṅghadāna drew greater participation for the second Saṅghadāna which was held in 2015 during the 3rd Dhamma Walk. 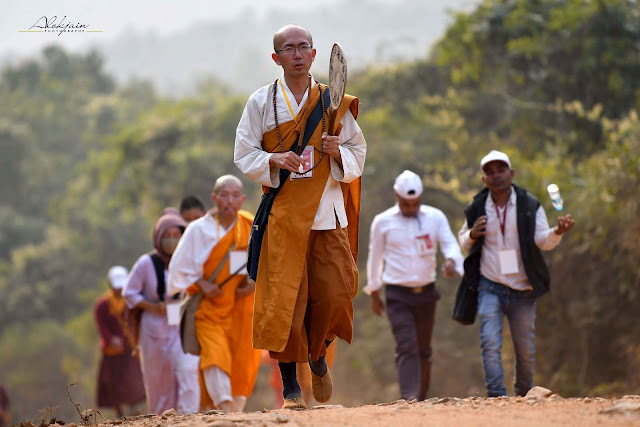 The third Saṅghadāna held at this year Dhamma Walk was partly sponsored by two Buddhist practitioners from Canada, Jacques Achsen and Bob Jeffs. Based on the advice given by Jacques and Bob, the villagers very thoughtfully prepared dishes with ingredients available during Buddha’s time such as barley, rice and Bengal gram. 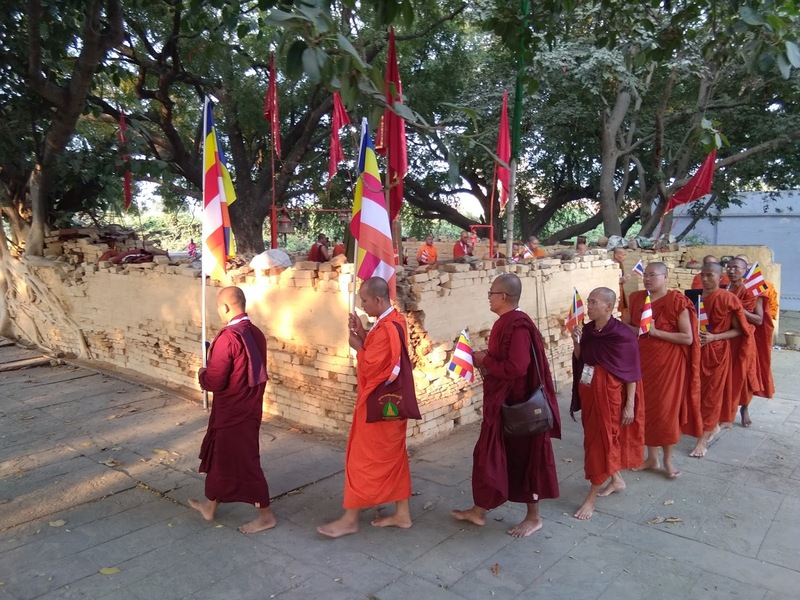 This year’s Saṅghadāna was a beautiful ceremony like ancient times. Villagers stood at their doorsteps with food prepared in advance and served them onto the plates and bowls held out by the monks and nuns walking in a silent queue. 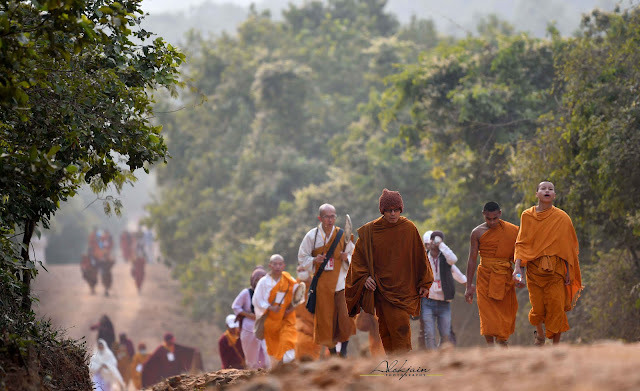 Just as the monks and nuns were touched by the compassion and generosity of the villagers, the villagers too were moved by the grace and discipline of the monks. 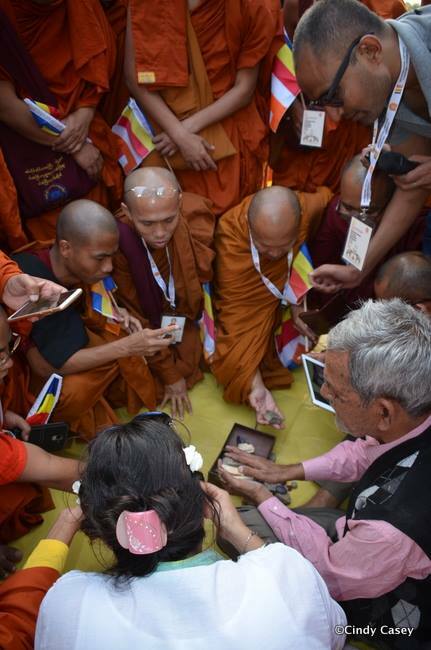 Laypersons seated on their knees making offerings to monks and nuns lined up for the Saṅghadāna. Monks walking from home to home collecting food. A monk thankfully accepting food from two village girls. 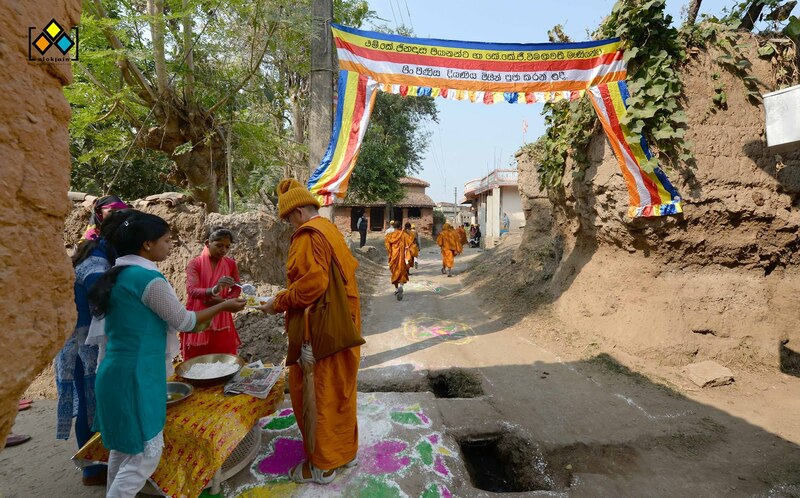 Village children making rangolis in the morning of the day of the Saṅghadāna to welcome devotees and laypersons. offering prayers before starting their meal. 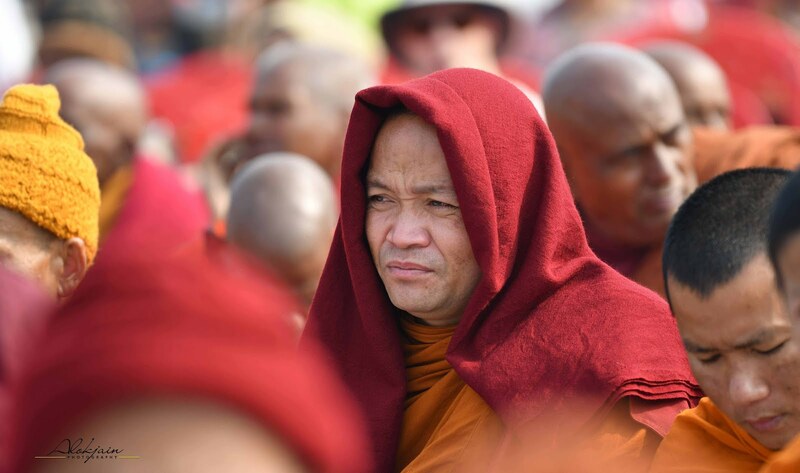 Leading the prayers is their Venerable Master. Venerable Lama Lobzang (President of IBC) sitting alongside village while the monks and nuns had their meals. 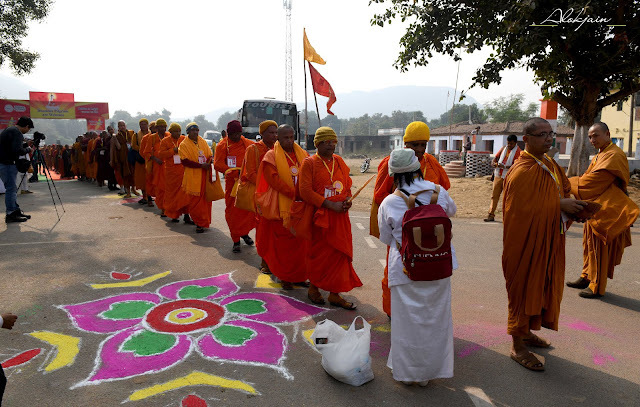 while villagers supply them with water, sweets, fruits, extra plates, and tissue papers. Chinese group chqanting before starting their meal. 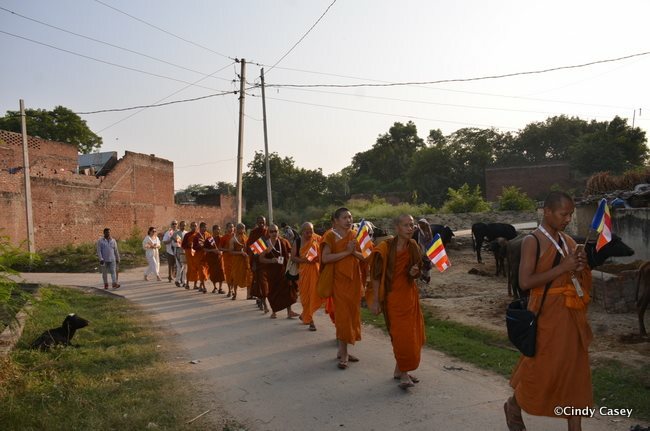 After the Saṅghadāna, the monks and nuns gathered for the inaugural session of the Dhamma Walk. 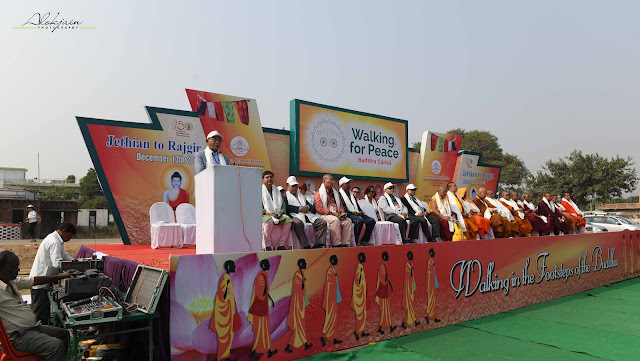 As in previous years, the consisted of addresses from the various organizers and important dignitaries. This year’s speakers included Dr. Dipankar Lama (Associate Professor, Nava Nalanda Mahavihara), Ms. Wangmo Dixey (Executive Secretary, LBDFI), Ven. Lama Lobzang (President, IBC), and Ven. Dhammapiya (Secretary-General, IBC) along with a few others. Ms. Wangmo Dixey (Head of LBDFI) addressing the gathering of monks, nuns and laypersons at the inaugural session. Soon after the inaugural session commenced the pilgrimage walk. 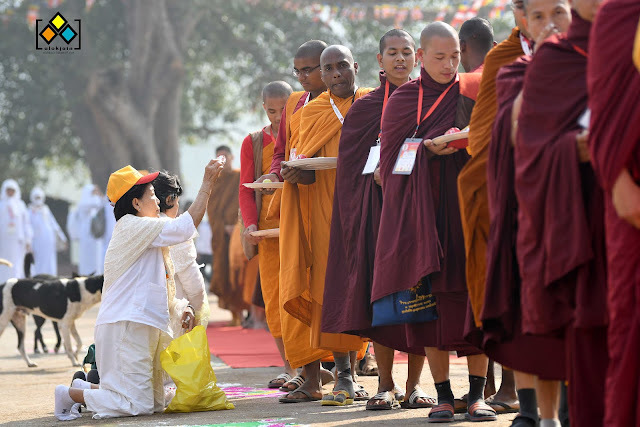 This year witnessed the participation of more than 1000 monks, nuns, eminent masters, laypersons, and locals from different countries, namely China, Vietnam, Korea, Sri Lanka, Japan, Thailand, Myanmar, Bhutan, Malaysia, Taiwan, Laos, Cambodia. 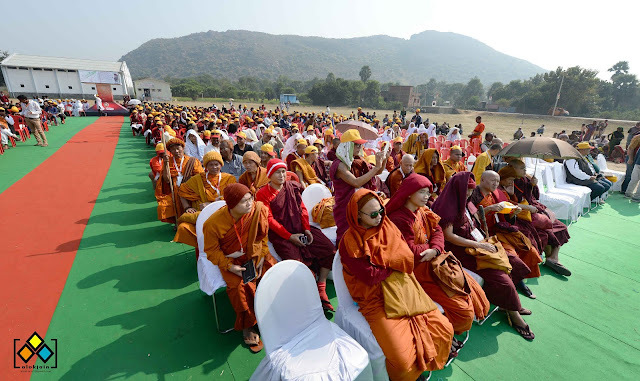 The oldest participants were monks and nuns over eighty years of age while the youngest ones were devotees and locals under the age of twenty-five. 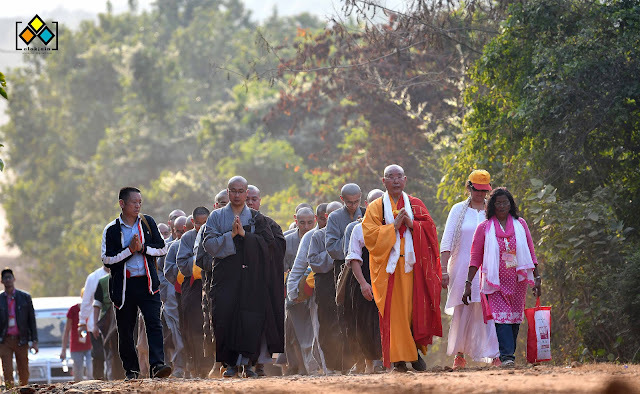 The wide age group of participation was a clear reflection of the eagerness of devotees to have the spiritual experience of walking in the footsteps of Buddha and Master Xuanzang. 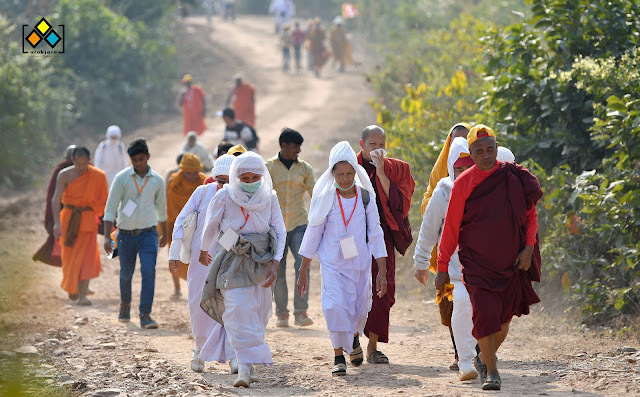 The high-spiritedness of the devotees was also evident from the constant chanting as well as silent praying that went on as long as the walk lasted. The local villagers happily assisted the participants in completing the 15 km walk by supplying water throughout the walking trail and looking after those who fell behind others. 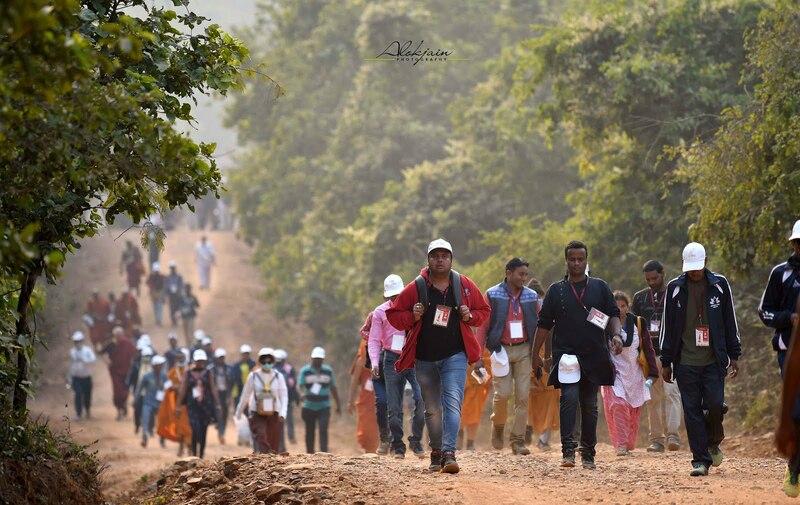 The day ended for the participants at Veḷuvana (Bamboo Grove) in Rājgir where they thanked by organisers for their enthusiasm and energy. 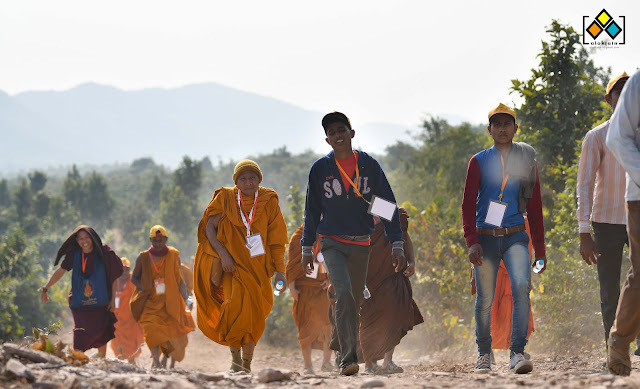 The Dhamma Walk was an extraordinary display of the synthesis of the energy of local villagers and devotion of monks and nuns. 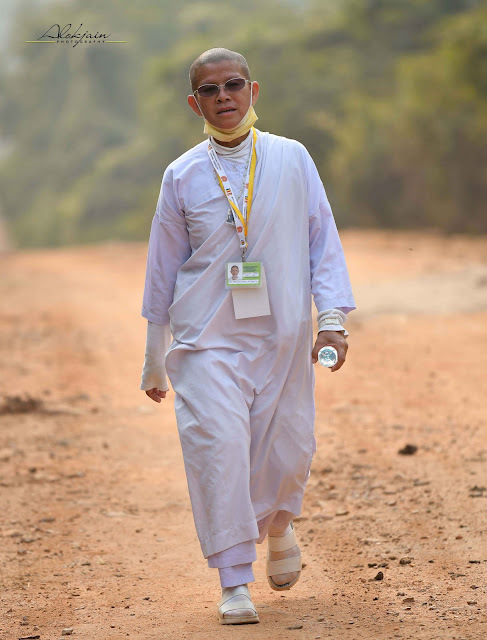 at the 4th Dhamma Walk from Jeṭhian to Rājgir, 13 December, 2017. 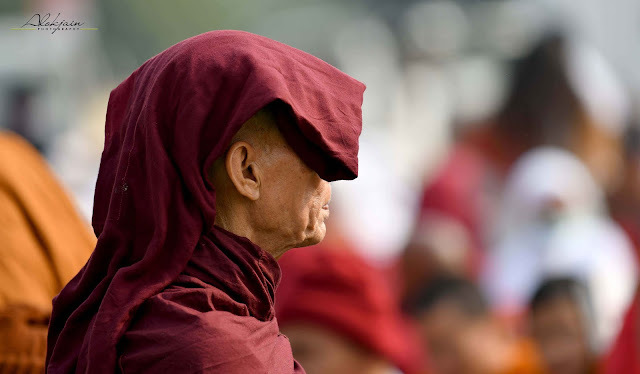 Two monks walking past a stupa. Such stupas are erected all along the pilgrimage trail to mark every one kilometer. 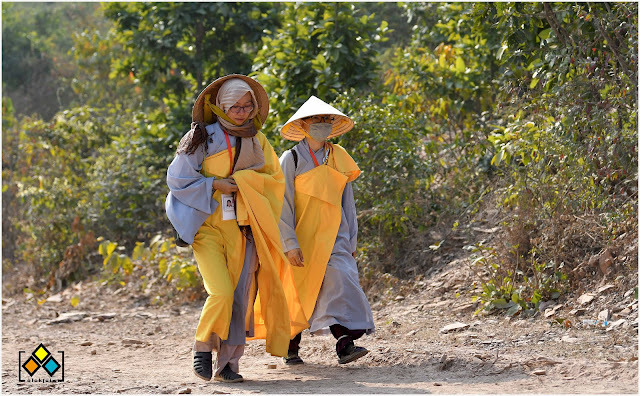 Two Chinese nuns walking side-by-side while protecting themselves from the sun and dust. to supply water and pick up those who were falling ill.
A very young monk taking a break during the walk. 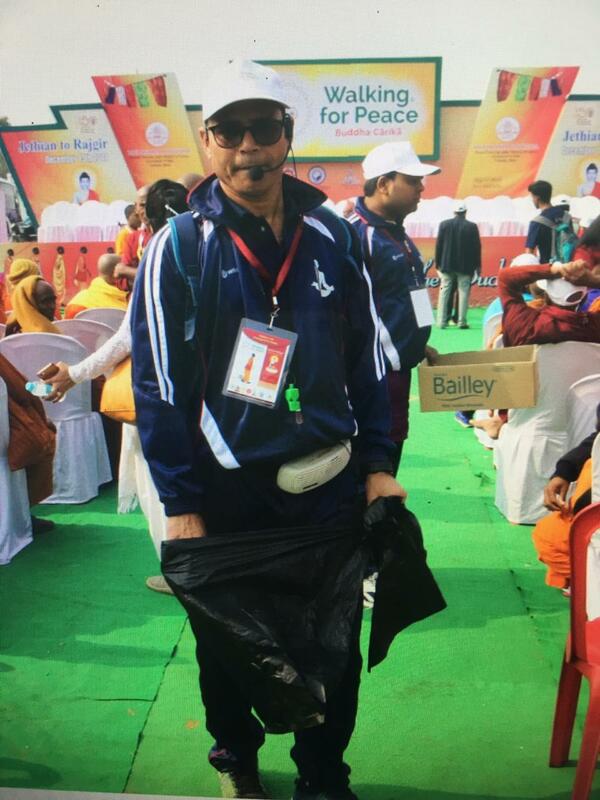 it did not break the resolve of participants, both old and young, from finishing the walk. 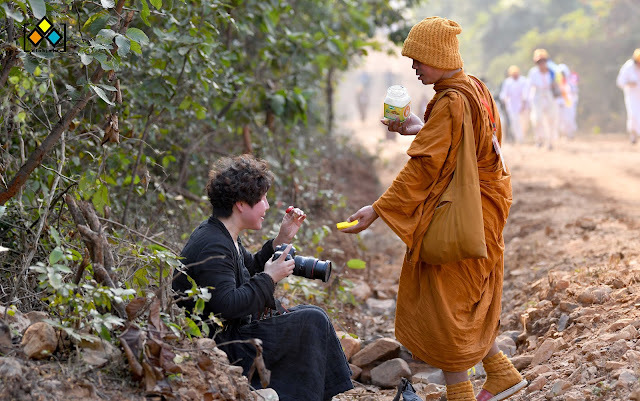 A monk offering refreshments to a lay participant on the walking trail. 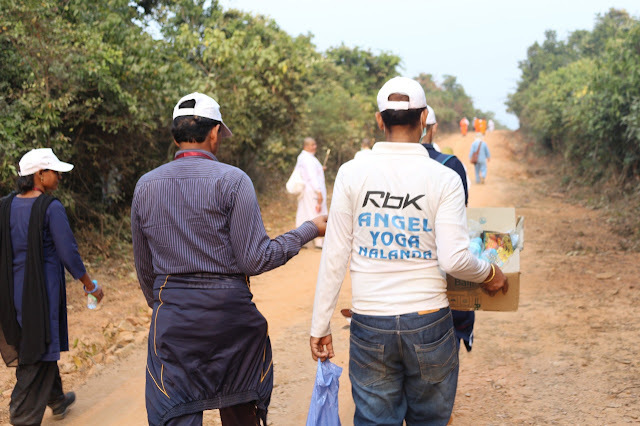 Local village boys volunteering to walk with the devotees and look after those of them who needed help. A monk equipped with a camera to capture the beautiful moments of the walk. Participants jubilating at the finish of the walk. 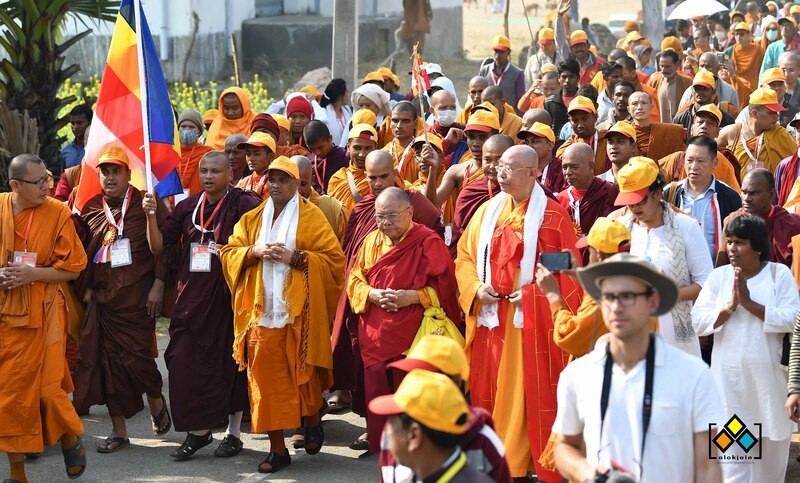 December 2017 marked the fourth time of the holding of the Dhamma Walk. The successful organising of the walk for four consecutive years is a commendable feat given the extent of arrangements that have to be made at the village of Jeṭhian and along the Jeṭhian- Rājgir walking trail and the level of communication and coordination required between organisers, government officials, local villagers and participating monks and nuns. 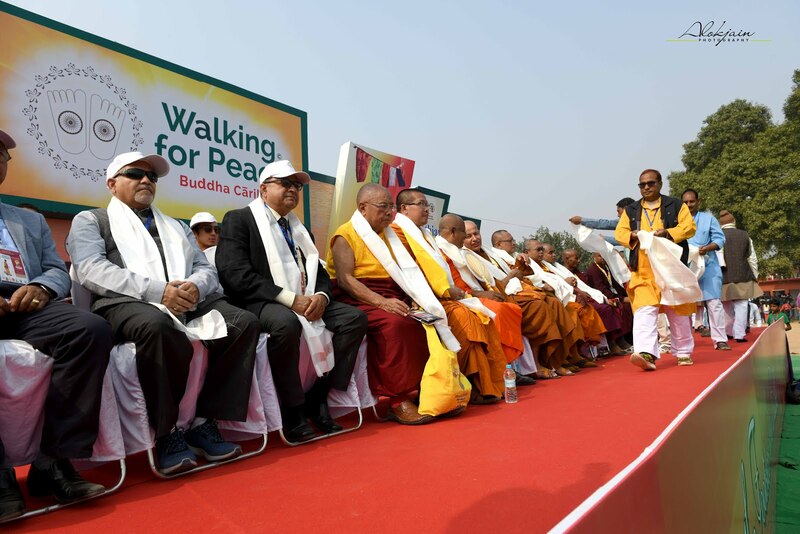 On behalf of the organisers of the Dhamma Walk, I thank Shri G C Bhuyan, Director, India Tourism, Ministry of Tourism, Government of India for sponsoring 1000 caps for the participants of the Dhamma Walk. I specially want to mention that Ms. M. Manimekalai, Principal, Jawahar Navodaya Vidyalaya, Jeṭhian was constantly in touch, enquiring if we needed any help. The mobile medical unit from Civil Hospital, Rājgir did a wonderful job by following the Walk. 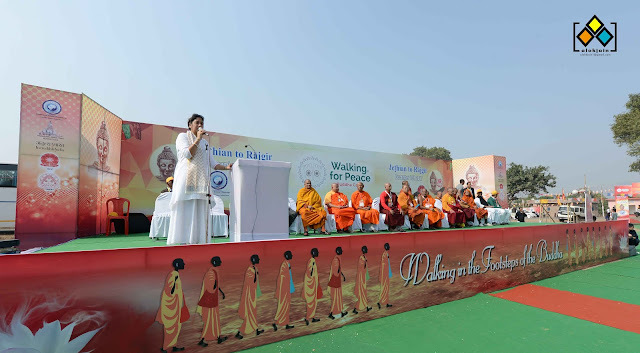 Last but not the least; I would like to thank the men, women and children of Jeṭhian, who volunteered their time to help make this event enjoyable. Pārwati Hill (Indraśailaguhā) - From Dream to Reality. Please do not copy any content from this blog without consent.. Simple theme. Powered by Blogger.